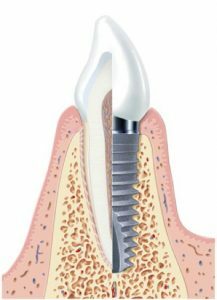 What’s a dental implant ? A dental implant is an artificial root that replaces the tooth root. It is used to support the dental prosthesis: crown, bridge and fixed or removable dental prosthesis. Dental implants consist of a small screw which is surgically inserted without pain into the jaw. It’s made of biocompatible titanium that is both lightweight and durable. The bone of the jaw fuses with the implant over time. The benefits of dental implant. Dental implant offers the best solution to replace a missing tooth. The main concern is to avoid crowning healthy teeth to make a bridge or to avoid wearing a removable, full or partial dentures. Aesthetic Enhancement: Implants offer the best cosmetic and functional results. Reduced bone loss: Implants prevent a greater loss of bone structure. Less invasive (tooth preservation): It is not necessary to trim adjacent natural teeth: they remain intact. Renewed Function and Self-Confidence: Implants provide a stable base for new teeth and allow you to talk and eat comfortably and safely. They no longer require a paste or glue to fix the prosthesis. Reliable: Implants tend to be an extremely effective solution. Long term studies show higher rates of success. Implants can last a lifetime, when they are properly placed by a trained dentist in the technique. They need a good oral hygiene care. Better dental hygiene:Finally, implants do not require a special cleaning or extra attention. The new teeth are treated like natural ones. They necessitate regular brushing, the use of dental floss and dental hygiene checkups. ARDENTYS dental clinic uses implant systems recognized worldwide for their excellent quality and clinical decline. The implants are made of titanium, a biocompatible metal that is very well tolerated by the body and integrates durably with the bone tissue. In addition, in certain clinical cases, Computer Aided Design and Manufacturing (CADM) allows to create customized pillars to ensure the best aesthetic results. Finally, implant prosthesis are fabricated by a french laboratory, qualified in implantology.